This connector mates to the AMP/TYCO part number 1-1419168-1, 1-1419168-2, 1-1419168-3, 1-1419168-4, 1419168-7, and 1419168-8 connectors in the GET 0.64mm series connectors. The CASPERS connector does not have polarity, so it can be used with any of the above mentioned parts. 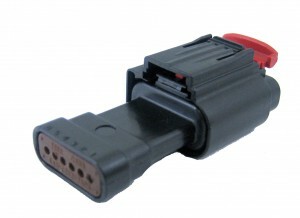 This connector is commonly found on FORD MAF sensors, MAZDA drive-by-wire sensors, and other vehicles.